VIDEO: Coronal mass ejection captured on April 16, 2012 by NASA’s Solar Dynamics Observatory. A beautiful prominence eruption producing a coronal mass ejection (CME) shot off the east limb (left side) of the sun on April 16, 2012. 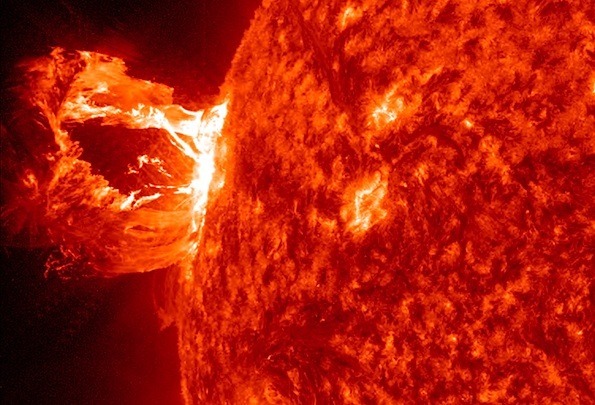 Coronal mass ejections are often associated with solar flares. 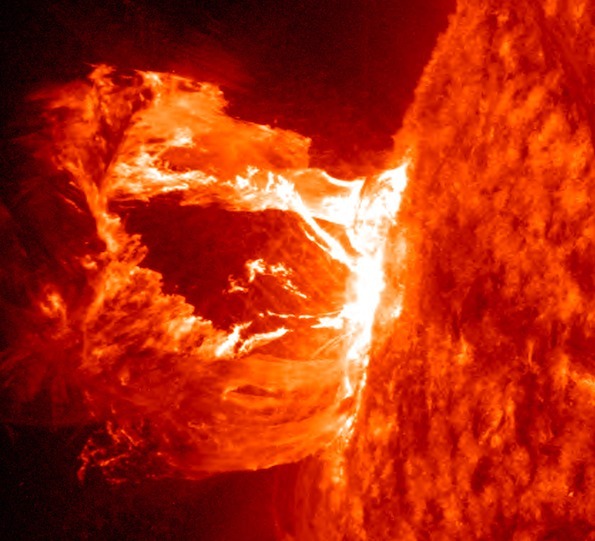 An M1 class (medium-sized) solar flare occurred at the same time on April 16, 2012, peaking at 1:45 PM EDT. The coronal mass ejection was not aimed toward Earth, so no alerts or northern lights are expected from this event. Mass coronal ejection on April 16, 2012 was captured here by NASA’s Solar Dynamics Observatory in the 304 Angstrom wavelength, which is typically colored in red (Photo Credit: NASA/SDO/AIA). Mass coronal ejection close-up on April 16, 2012 was captured here by NASA’s Solar Dynamics Observatory in the 304 Angstrom wavelength, which is typically colored in red (Photo Credit: NASA/SDO/AIA).